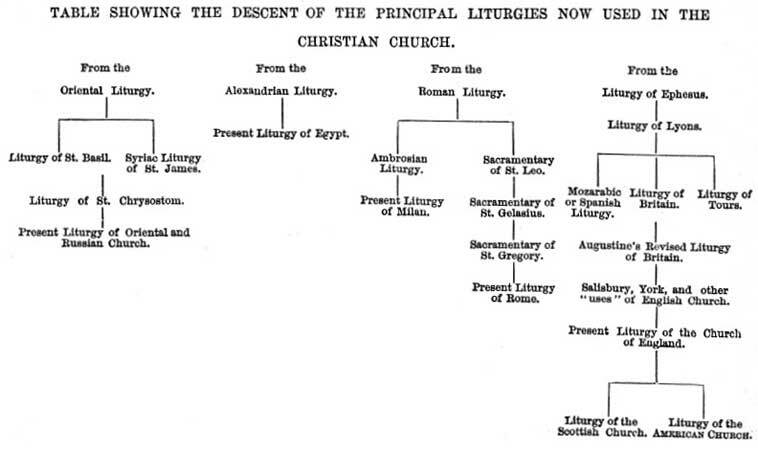 THE LITURGY, AND ITS USE. ON SUNDAY, MAY 14TH, 1871. Published by request of Members of the Vestry and Congregation. "Hold fast the form of sound words which thou hast heard of me." 2 Timothy i. 13. THERE is a popular fugitive poem, much quoted by Christians of other names, which represents a Churchman arriving at the gates of Heaven with a Prayer-book under his arm. He is, however, notified by St. Peter, or some other in charge there, that he will have no use in that celestial country whither he is going for the volume which he has so sacredly cherished; and that, if he would be admitted there, he must needs leave it behind. The sarcasm is harmless enough, for if it means anything, it proves what some Christians would doubtless account quite too much. It is as effective when applied to the Bible, as it is when applied to the Prayer-book. We shall doubtless need neither volume if we ever reach the celestial Kingdom, though it May be as little doubted that we shall find them both useful [3/4] while on the way there. There are a great many helps heavenward which we can well afford to dispense with when we reach our destination, but which we can illy get along without until we do. And so the Apostle's injunction to Timothy, in the text, has as living appropriateness to-day, as when his aged hand first penned it. We do not know precisely what form of "sound words" it was to which he bids the faithful Bishop hold fast; but, though some good men, afraid lest they should admit too much, have disputed that anything like a form, as we understand it, was meant at all, yet the shape of the Greek term upotupwsin, is at once indisputable and unequivocal, and admits of no other meaning. Some sort of form was delivered to Timothy by his father and teacher in the faith; and, whether it was a Creed or a Catechism, an Eucharistic service or a Litany, the Apostle bids him "hold it fast." If he was not to rest in the form, he was nevertheless not to despise it. It might not exhaust the truth, but it enshrined it, and in that light, he was to reverence and cherish it. With a sentiment no less reverent and vigilant does it become us, of to-day, to cherish that other form of sound words which the ages have preserved to us in our Book of Common Prayer. Redolent of the sainthood of the past, and [4/5] pre-eminent in its ever-fresh appropriateness to the present, I venture to affirm that we have in that volume a treasure only less precious than the Sacred Volume that lies beside it. Not an inspired volume--not by any means a perfect volume--there is yet no other, whether written in the nervous Saxon of our mother-tongue or in any other language, which we may venture to compare with it. Far more cordially than is our wont, it behooves us to recognize its remarkable history, and to realize its practical advantages. We are, too many of us, "Prayer-book Christians" (to accept a very common term of reproach), far more, because the question, with us, is merely one of taste, than from any other and deeper reason. And many more of us, while feeling that this is a very poor and unsatisfactory reason, feel uncomfortably that we have no other. When people assail us with the sneer that those who pray with a book must needs be lifeless formalists, and that to dispense with the book, is at once and of necessity to ascend upon a higher plane of devotion, we are silent, if not half-convinced; nay, we even and ourselves half-wondering, sometimes, whether the venerable volume which lies on our tables and in our pews may not, somehow, be almost as much an impediment to devotion, as a help. For one, however, I venture to pronounce [5/6] such an assumption at once profane and untrue. I base my use of the Prayer-book upon the threefold testimony of Scripture, of History, and of personal experience. Our Liturgy is not a mere caprice, nor a mere aesthetic convenience. It has roots, and finds an enduring justification alike in the Word of God and in the wants of man. It may seem cold and lifeless to us, because we too often come to it with a cold and lifeless interest. But it has in it the fires of God's own inspired Word, and the enkindling aspirations of the saintliest spirits of the past. Our need, in these days of much disputation concerning modes of public worship, is, first, to appreciate it more intelligently, and then to use it more fervently. I. First, I say, we need to have, concerning this Liturgy or Prayer-book of ours, a more intelligent appreciation. Look with me, for a moment, at the authority on which we use it, at the sources whence we derive it, and at the testimony which bids us cherish it. It is true that later encroachments of Rome somewhat corrupted the Prayer-book of the Church of England, and that, at the Reformation, considerable changes were made in several' of its Offices; but these changes neither invalidate its venerable origin nor destroy its essential identity: "where was your Church before the Reformation?" a disciple of Rome was once heard to ask a disciple of England. "Where was your face, before you washed it this morning?" was the prompt and somewhat staggering response. If homely, it has at least the merit of a double applicability.. It describes not only the history of our Church, but the history of our Prayerbook which latter, our Reformers, in freeing it [11/12] from the incrustations of Latin error, only made more deserving of our greater reverence and our deeper love. (c.) Would that I might detain you to hearken to testimonies of that veneration and love, as they have, through many centuries, been uttered, not merely by those within the Church, but also by those without it! It was the Methodist, John Wesley, who wrote: "I believe there is no Liturgy in the world, either in ancient or modern language, which breathes more of solid, scriptural, rational piety, than the Common Prayer-book." It was the Baptist, Robert Hall, who wrote: "The evangelical purity of its sentiments, the chastened fervor of its devotion, and the majestic simplicity of its language, have combined to place it in the very front rank of uninspired compositions." It was the leading Congregationalist divine of our own land, who long ago wrote, "We have never had a doubt as to the excellence of the Episcopal service in public worship . Should our children find their religious wants better met in the service of the Episcopal Church than in the Plymouth Congregational Church, we should take them by the hand and lead them to its altars, . . . . . with the unhesitating conviction that if they did not profit there, it would be their own fault." And if such have been the testimonies of [12/13] strangers who could at best but imperfectly know the excellencies of the Church's Liturgy, what wonder if it has proved a source of ever-increasing help and edification to her children, so that multitudes of them have echoed the language of saintly George Herbert, who dying, said to one beside him, "Sir, I see by your habit that you are a priest. I desire you to pray with me." And when the question was put. in answer, "What prayers?" exclaimed, "O sir, the prayers of my Mother, the Church of England--no other prayers are equal to them!" II. What, now, has such a Liturgy a right to claim from us, if not that, striving to appreciate it intelligently, we should also strive to use it fervently? If we possess those noble formularies of ours only to exult over those whose worship is more. bald and jejune, and less grand than ours; if we hearken to any extemporaneous service only to contrast its meagreness, its lack of dignity, its often irreverent familiarity, with our own statelier and devouter services if we smile at the unlettered fervor of stammering and ill-arranged petitions in other sanctuaries, while we refuse to put our hearts and voices into the elevating supplications of our own, then we area unworthy of our grand and venerable heritage, and deserve to forfeit altogether the high privilege [13/14] of its use. What must the Almighty Being, whom we profess to worship in these forms, think of a congregation, when He sees not a few of those who compose it, lolling through the Church's solemn services with ill-concealed impatience and ennui? No wonder that even such noble forms of worship as ours are wearisome to one who is too indolent to follow their sublime progress--too careless even to conform to the external postures which they require! Granted every concession to the aged, the infirm, and the overworked, which it is most right and fitting to make, and there are still a great many in our congregations whose listless bearing, and conspicuous inattention, must needs make it a matter of perpetual wonder to any thoughtful person why they come to church at all. We seem to forget, too many of us, that the supreme design of a liturgical and responsive worship, such as ours, is that the people should, all along, take audible and visible part in it. If they are to be assembled on the Lord's day only to be prayed to, and preached to, and sung to, to sit as spiritless automata while a service is performed (odious word in so sacred a connection!) before them, then I see not why our praying and worshipping may not be left, as in the East, to machinery why we may not borrow some Hindoo contrivance which shall grind out our [14/15] prayers by means of the revolutions of a millwheel! For myself, rather than minister to such a congregation, I would choose eagerly the noisiest assemblage of the most excited of Methodists, where at least the hearty and fervent Amen, gave evidence of responsive interest and awakened feeling! Two or three things are greatly needed, then, if our worship is to be worthy of the Liturgy by means of whose noble forms we offer it. Bear with me, while, in closing, I briefly refer to them. (a.) One of these is a more cordial and visible conformity to the postures which the Church in her worship enjoins upon us. Let us strive to stand up, and kneel down, honestly and unequivocally, when the rubric bids us to do so. A posture is not religion, and I presume one cane pray on his back and in his bed, as devoutly as on his knees beside it. But he is apt, in the former case, to go very speedily from praying to sleeping and that homely fact includes the philosophy of the whole matter. Refine as we may, there is a reflex influence from the posture upon the mind. The subject instinctively drops upon his knees when he brings his petition to his Sovereign, and he offers that petition all the more fervently because he offers it kneeling. We shall pray more earnestly, and praise more ardently, and adore more devoutly, when the [15/16] outward man takes on the attitude which in these various offices of religion, a wise and venerable experience enjoins. (b.) Another thing that is even more urgently needed among us, in our worship, is a habit of audible and hearty response. There is something electric in the answering tide of voices rising from a great congregation, which even the dullest soul must feel. But to murmur faintly through a service, scarcely lifting the voice above a feeble and inanimate whisper, is to drown our whole worship to inevitable coldness and monotony. Before the first response appointed to the congregation in the Morning Service, it used to be written in the rubric of the English Prayerbook, "Then shall the people, here, and elsewhere also, answer with a loud voice." O the service; that I have shared in, in the sanctuaries of our dear Mother Church beyond the sea, where every voice of all the people caught the deep refrain of Psalter, Prayer, or Litany, and sent it upward in a mighty wave of sound until the stately arches rang again! God send us, speedily, the day when it shall be our glad privilege to use the Church's glorious forms of worship with the same open-mouthed, devout, and joyous ardor! Along the realms of upper day." 1st, The Oriental Liturgy, otherwise known as the Liturgy of St. James, or of Jerusalem. This Liturgy appears to have been composed for the Patriarchate of Antioch. It is quoted by St. Jerome, St. Chrysostom, the historian Theodoret, and others, and may be even more exactly traced in the eighth book of the Apostolical Constitutions. 2nd. The Alexandrian Liturgy, or the Liturgy of St. Mark. Bunsen assigns to this Liturgy a date as early as the., second. century, (Bunsen, Analect. ante--Nicaen. iii. 106.) Palmer. regards it as probable that it was as old as the Apostolic age, and quotes an Alexandrian Patriarch of the twelfth century, showing that it was then spoken of as written by James the brother of the Lord. [Palmer, Orig. Liturg. I., 87.] It was undoubtedly use 1 in the Patriarchate of Alexandria at a very early date.